When I first found out about UX, I wanted to learn as much as I could about it. Although the internet is an amazing resource with many articles, blogs and videos to use to your advantage, I do love a book. I love how you can take your time with it and mark important sections for reference later and how you can carry them anywhere and you do not need an internet connection to use them (perfect for the train then). So over the last couple of years I collected a good selection, and this year even managed to convince my husband to put up a new bookshelf just for my UX books. I know it will not be long before it is full. But where to start? 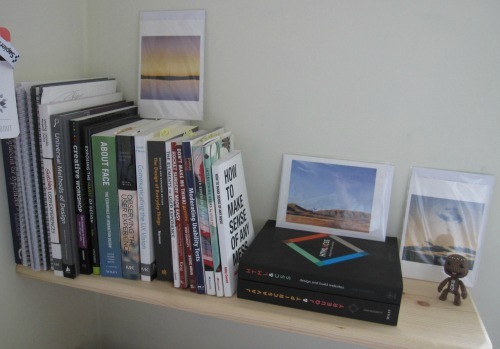 There are hundreds of books on the subject of UX, so how do you know which ones are any good. 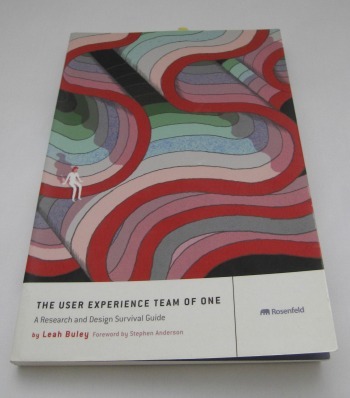 I can not remember how I came across it, but one of the first books I bought and read was Leah Buley's The User Experience Team Of One. The attraction at the time was the fact that I was the only one in my organisation actively looking into this subject, and as I was not sure where to start this seemed like a good place to begin. What I really enjoyed about this book was all the practical advice she gives. These are real things you can either do by yourself or with a team to produce an outcome that is good for your business and for your users. Buley also explains how you will need to evangelise UX to your organisation to show the value and purpose. This means learning how to educate and influence, both subjects she covers in the book. The book is split into two sections, starting with the philosophy which talks about what UX is, how to get started, how to build support for your work and how to grow yourself. She then moves on to practice which covers planning and discovery methods, research methods, design methods, testing and validation methods and evangelism methods. "Buley gets you thinking about what you are trying to achieve"
Each methods section includes 4 or 5 different methods which go into more detail on how to use them to your best advantage. This includes details on how long it will take, including planning and prep, when to use the method and all the different ways you could do it. For example a Strategy Workshop could include the following activities: Triads, Elevator pitch, Artifact from the future, Storyboards, Moodboards, and Kano model. This is not an exclusive list, but it gets you thinking about what you are trying to achieve and how to do this. Other methods, for instance a Listening Tour, might have less activities but many different sorts of questions you could ask. Again Buley gets you thinking about what you are trying to achieve, the different sorts of questions to ask and what to do with the information after. At the end of each method she includes a tips and tricks section, and at the end of the section a bit called 'If you only do one thing...'. This was an easy to understand read which gave me lots of practical ideas on how to take UX forward in my organisation. It is probably aimed more at people who are a bit new to UX. If your organisation has heard about it and tasked you to do it, without really understanding what UX is, then this book would be perfect for you. If you have been doing UX for a bit then maybe you are aware of most of these methods already. The value here then would be if you have just joined a new organisation as the soul UXer and need to get people onside. It is the sort of book you can dip into when you need inspiration either on what to do next or on how to run a session. As a first book to read this was a real gem helping to get me even more interested in the subject. And, as I was soon to find out is common across UX books, it includes a list of further reading which set me on the path of having a bookshelf just for UX books.